Every handmade business owner I know wears too many hats. There is no business more time consuming than the one where you are your own factory. It is understandable, when starting out, that every business owner needs to be the maker, the promoter, the website designer, the photographer, the bookkeeper etc. Unless you have lots of startup capital, it is necessity that demands you be everything. At some point, however, you must plan to delegate those tasks that keep you from moving your business forward. Don't spend countless hours on accounting when the money you will spend on hiring a bookkeeper will free up your time to promote your business. As soon as reasonably possible, invest in hiring part time help. Whether it's getting help to run errands, update your social media and website, or someone to help you with production, get the help where you can. Wearing all the hats in your business will eventually sabotage your business because it just isn't possible to be everything without sacrificing business growth. You just summoned up the courage to call five stores about wholesaling your collection. Two said no thank you and one said you can email your line sheets to the buyer. Two of them said they were not looking for new collections, but the conversation was open ended with a hint of "try us in a couple of months." After emailing your line sheets, weeks pass and you hear nothing. What do you do? Do you call them back or move on to the next potential client? Putting yourself out there can be challenging and, at times, it may feel like it would be easier to wait until you receive a solid go ahead, a validating show of enthusiasm, an immediate YES! It's no surprise that many handmade business owners will not follow through after initiating contact, especially if the first interaction with a store is not overly encouraging. The only way to grow your business faster is to follow through on leads even when it feels uncomfortable. Apply this attitude and persistence to every area in your business and you will reap success! Running a handmade business is not an intuitive process. Not like an artist's drive to create. Although it may come naturally to those who have a mind for business, for most it's a process of trial and error and learning from ones mistakes. In order to fast track your business and not set yourself back with costly mistakes, there are a few key issues to avoid. The first being, operating your business without a plan. Most of us are guilty of riding by the seat of our pants when it comes to scrambling for cash. It takes time to grow a business and that means there will be times when cash flow is low or even non existent. The focus then becomes on the now and planning for future growth gets bumped by immediate necessity. Even, and especially when times are tough, you need to be implementing strategies for future growth or you will continually find yourself in the desperation of now. The main areas to focus on for your business growth are short and long-term goals, task scheduling, production planning and promotional planning. Without a business overview you risk overspending on a collection that may never see the light of day. By that I mean you cannot reasonably estimate business expenses without implementing sound production and promotional strategies. For example, if you are selling handmade jewelry there can be temptation to set no limits on material purchasing. Creative people are frequently compelled by the drive to create and often don't develop a habit of monitoring spending. Overspending in order to make every fabulous design idea come to fruition, with no spending cap, will inevitably lead to profit loss. It can be hard to tighten the purse strings when one is inspired to create. This is where your business self has to step in and make some decisions. How much do you want to create this year? How about this season? What is your budget for that? Set limits on your spending and implement a promotional calendar to create revenue. If you know that you will be participating in three upcoming shows and you will be approaching five stores a month regarding wholesale, then it makes sense to curtail spending to meet those specific goals. Your budget can be adjusted as you meet those goals, but spending without a plan will likely lead to more money going out than revenue earned. Keep a detailed business overview of where you are financially, when you will be producing your products, how much you will produce and how, and when, you will promote your work. Having a clear overview at all times will mean that you can balance spending with your earnings. One of the best ways to stay on top of spending/production is to implement an inventory control system into your business early in the game. I highly recommend Craftmaker Pro for keeping track of suppliers, supply costs, finished inventory and raw material inventory. Doing this early will keep you on top of your supply needs and tell you when it's time to produce more finished product. Planning a new design? Once your raw material costs are entered in Craftmaker Pro you can easily calculate and set your wholesale and retail prices. Stay on top of your business spending, production and promotion and you will have a solid foundation on which to keep building. A handmade business without branding is a hobby. That may sound harsh, but the truth is you can't afford not to brand. Without a clear business image your work just looks like a bunch of stuff that people aren't likely to remember. What does your business stand for? What does your business stand against? Choose colors that express your message. Your colors could say your brand is light and carefree, seductive and mysterious or edgy and bold. Although color is only one element of branding, it's a vital element as it elicits an immediate emotional response. Identify what drives you, what your core beliefs are and what frustrates you as a consumer. Take that information and make it part of your business philosophy. Use it in your tagline and create a vibe that communicates the essence of your brand. Visit other websites and get a feel for what you like and what you don't. Solve the problems you experience as a consumer by creating and environment that offers your customers an elevated experience. How do you want customers to feel when they see your work, visit your booth or set eyes on your website? If you can't answer that question, you won't know what effect your website will have on your visitors. Branding is all about consciousness. It's about bringing what is deep in your heart and soul, deep in the recesses of your mind, into your conscious awareness. Only then can you brand to reach your intended audience... your ideal customer. The 80/20 rule, when applied to customer acquisition versus customer retention, says 80 percent of your business comes from 20 percent of your customers, meaning that most of your business comes from repeat customers. Yet, many handmade business owners spend most of their effort on acquiring new customers. If 80 percent of your business comes from repeat customers it only makes sense that a good portion of your time should go into customer retention. What is customer retention? It is all about nurturing your relationships, giving your customers what they want and making them feel valued. Making them feel like you really understand them and appreciate them. This is an important one and yet it's commonplace to quickly move on after a sale is made and switch the focus onto getting that new customer. Yes, put your energy into acquiring new customers, but never at the expense of ignoring and losing your current buying customers! 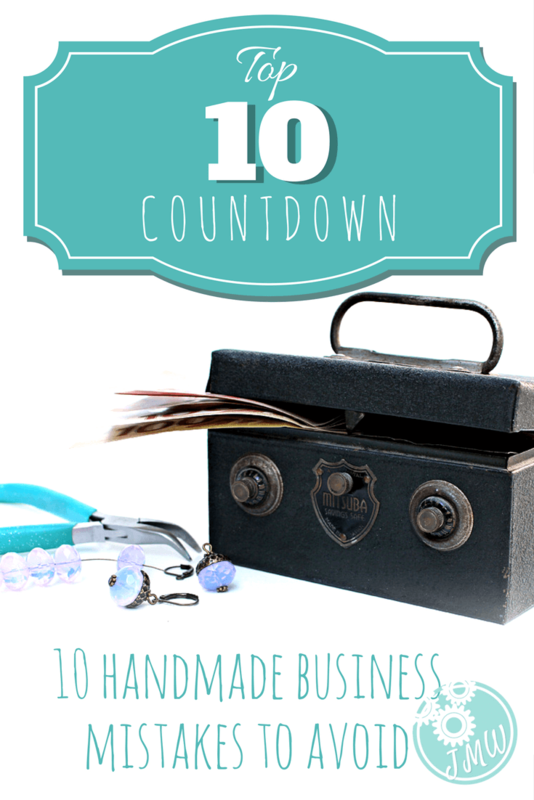 Waiting to start your customer mailing list will only delay how quickly you can grow your handmade business. One of the most common regrets business owners make is not starting their list from day one. Even if you haven't set up your own website yet there are several ways you can build your list. When you exhibit at a show or festival, bring along an email sign-up sheet or a sign-up app on your tablet or smart phone. Mailchimp is one of the leading email service providers and it will cost you nothing to get started. You can even get a sign-up form that will integrate with Facebook so you have another free way to collect addresses online. Building a list early is a great way to keep in touch with customers and interested prospects so that you can develop a relationship and stay in their sphere of attention. While you may not have a website to send customers to today, you will be armed with a list of subscribers when you launch.... which brings us to our next tip. There is no reason not to have an online presence in this day and age. At the very least, an Etsy shop, a blog and a business Facebook page will provide access for potential customers. This will cost next to nothing and you will have a solid way to promote your business. You might be surprised to know that many handmade business owners don't have a website or even a free blog for customers to contact them or see their work. Craft show visitors often seek out artists by visiting artist listings on show websites after a show. There is nothing more disappointing than not being able to find an artist's work online after a show. Not only does this result in lost sales, but also in lost interest. If you feel you're lacking the skills to set up a web page, or you're not ready to commit to monthly fees, consider setting up a free one, or two, page site on a website builder such as Weebly. There you can set up free pages and embed a Mailchimp form without too much fuss. Create a gallery of your work by loading your best images, list your craft show lineup, embed a sign-up form and add a link to your Facebook business page so interested customers can message you, find your show schedule and subscribe to your list. While it does take time to create a following online, without online representation you are closing the doors to customers who have already seen, or purchased, your work and are motivated to find you online. Simply put, don't compete on pricing in the handmade business market. You are not selling eggs where the variables are limited... free range, omega-3, brown eggs, small eggs, extra large. Art is subjective and the value you place on your work is relative only to three things. Product interest, perceived value and what that market will bear. Your price points dictate the clientele you will attract as well as the "perceived value" of your work. In order to establish ideal pricing, within your market, you will likely have to play with your price points until you reach that sweet spot between not too high and not too low. It is always better to price just a little higher than to price too low. Competing on pricing in a handmade business immediately puts your collection in the "low value" arena, meaning the perceived value of your work will drop below a standard that will keep your business sustainable. A close second that relates directly to the number one mistake is designing without knowing your audience. Who are you designing for? Who likes your work? What does s/he read, watch on TV or where does she shop? Identifying who your ideal customer is from the beginning will be your number one strategy for designing for and reaching your intended market. Most of us are guilty of designing pieces that we like. Of course, that's what makes us happy. If we didn't fulfill that desire to design what we most love, what would be the drive to create? Not everyone designs simply to meet a trend because not all trends speak to us and that's okay. The great thing about design is that there is a market for almost any handmade business, but it's our job to identify that market in order to successfully sell to it. Without that we are designing for no one other than ourselves. We need to identify our market so we know how to have a conversation with our customers. That conversation begins with the collection itself, how it is photographed, how we write copy, how our website branding looks and how we ask for the sale. Every checkpoint in your communication with your ideal customer, every point of contact, will not be heard until you identify what our ideal customer wants. On the opposite side of the spectrum is designing for everyone. This usually stems from wanting to capture the attention of everyone which leads us to our number one mistake that most handmade business owners make. The number one most important mistake to avoid is all about design. Almost every handmade business makes this mistake early in the game and that is promoting a collection that is undefined. Often starting a collection means experimentation and, of course, experimentation can lead to variety. Perhaps too much variety. While you do want to explore your design options in order to develop your line, it is imperative to make choices that will define your collection. Start by choosing one, or two, of your top designs. Taking into account aesthetics, trends and projected saleability, build a solid collection that stays within the style and theme of your top choices. Selecting your very favorite designs will mean that you feel 100 percent positive about what you are designing which will result in a tightly pulled together collection. Having a strongly defined collection always presents better for sales and is step one in creating a brand that is unique to you. Presenting a group of unrelated items is a sure fire way of losing sales. Even if you create one-of-a-kind pieces there should be a common thread that says each design was made by your hands. When your designs relate to each other, your collection will clearly present as a strong brand. Without that, you not only run the risk of lowering the perceived value of your work, but it will also be more challenging to attract a solid audience. This is step one in any handmade business and if you skipped this one, it's time to rethink your collection. A strong brand from design to presentation is the foundation to a strong business!